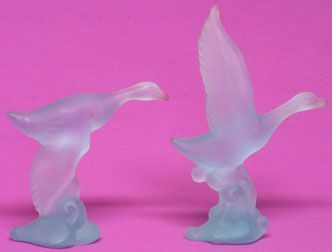 Heisey Ducks, Light Blue translucent. Produced by the Heisey Museum in the 1960's. I'm offering these by the pair or singly -- your choice. 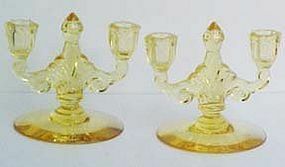 One is "wings up" (6.75"tall), the other is "wing's down" (5.75" tall). If you want only one, the cost is $26.00 per single duck. If you want both, I will let them go for $45.00 as a pair. 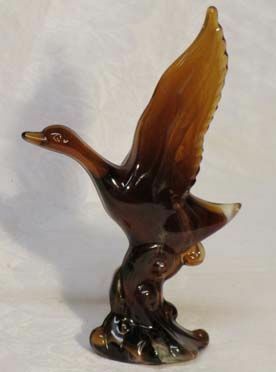 Heisey by Imperial Mallard is about 7" tall and the color is Amber Marble. This "wings up" duck is in mint condition. Made in the 1960's. 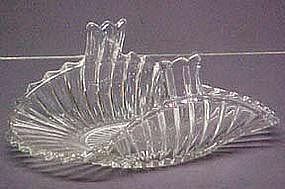 Heisey Plantation 12" crimped Fruit Bowl. Produced from the 1930's til the company closed in 1955. Hard to find and in mint condition. 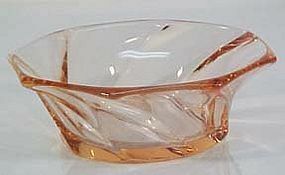 Heisey made items with the Orchid etch from 1940-57. This covered Butter in the Waverly Pattern is in excellent condition. 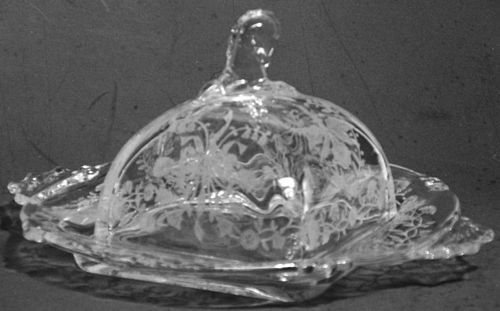 The plate is about 6.5" square and the dome cover is 3.5" square. If you have any questions, please feel free to ask. 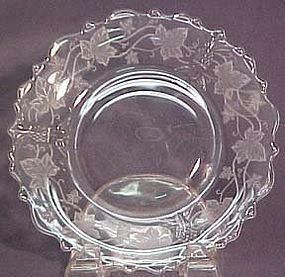 Heisey Plantation 7.5" luncheon plate with grape vine ivy etching. Produced from the 1930's til the company closed in 1955. Very slight usage scratches. Four are available. 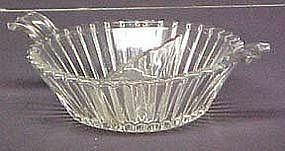 Here is a really nice divided crystal relish dish that is from the Old Williamsburg line of glassware that was made by the Heisey glass company from 1939 to 1957. 12" long and 4.5" wide, with logo, in excellent condition. 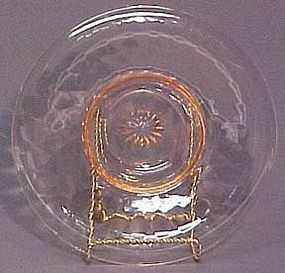 Heisey made this Colonial Panel Cheese & and Cracker dish (one piece -- not glued) before 1912 when it used the large diamond "H" logo. It measures about 9.5" wide and is in excellent condition. 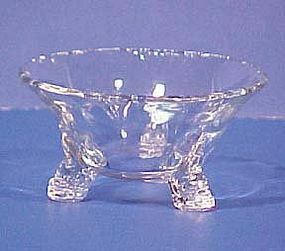 Heisey Empress Nut Bowls in crystal with dolphine feet are about 3" wide and 1.75" high. Three are available, all in excellent condition. Produced from 1930-38. 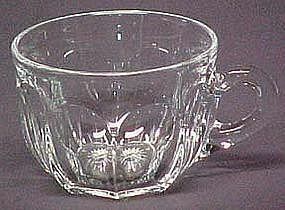 Heisey Colonial punch cup. 18 are available. Produced between 1935-44. All are in excellent condition with logo. 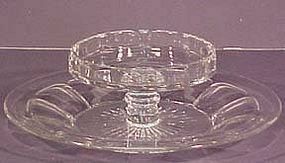 Heisey Ridgeleigh individual jelly is 3.1" across and oval. Produced between 1935-44. Only one left, in excellent condition with logo. 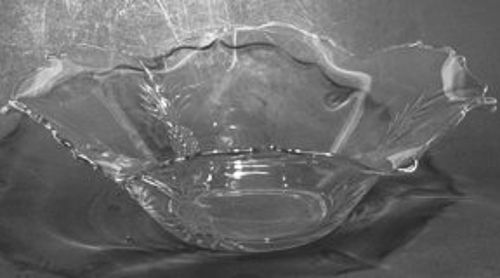 Heisey Ridgeleigh 2-Part Jelly Bowl, 6"
Heisey Ridgeleigh Bonbon is 6" across, with turned-up handles, 2-part. Made between 1935-44. In excellent condition. 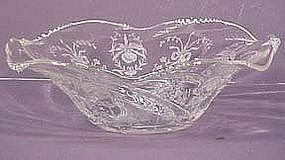 Heisey Orchid Etched 12" Bowl (Floral or Fruit). Pattern made from 1940-1957. In excellent condition.